NEWLY PUBLISHED – the sloths extraordinary metabolic response to temperature! We are delighted to announce that our latest sloth research paper was published today in the peer-reviewed scientific journal PeerJ! It is freely available for everyone to access and an online version is available here. The results are fascinating and underpin much of the unusual behavioural ecology that we see in sloths, however we understand that not everyone will have the time or sloth-like patience to trawl through the actual publication (and unless you are a scientist, you might find the paper a little tedious). For those of you who don’t fancy reading the full manuscript, we have written a short, simple summary of the project below. Typically, mammals have something called a thermo-neutral zone. This is basically a comfortable range of temperatures in which they use very little energy because they don’t need to control their body temperature (or thermo-regulate). This thermo-neutral zone differs between species, but it is usually always there at some point. On either side of this zone, either when it is too cold or too hot, mammals use lots of energy trying to make sure that their core temperature stays at a comfortable level. Reptiles and birds, however, don’t have this zone. They use very little energy when it’s cold and a lot of energy when its hot (because they can’t control their body temperatures and all metabolic processes work faster in hotter temperatures). To complicate matters, when faced with extreme conditions (such as hot/cold temperatures, or a lack of resources) many mammals can enter a ‘hypometabolic’ state (i.e. lowering metabolic rate) to conserve energy and aid survival until conditions become favourable again. Such states, including hibernation, daily torpor and aestivation, all vary in length but are characterised by a drop in both body temperature and metabolic activity. The molecular mechanisms underlying the active control and suppression of metabolic rate in mammals remain poorly understood and are the subject of a lot of recent research due to the potential far-reaching medical implications. But where do sloths fit into all of this? 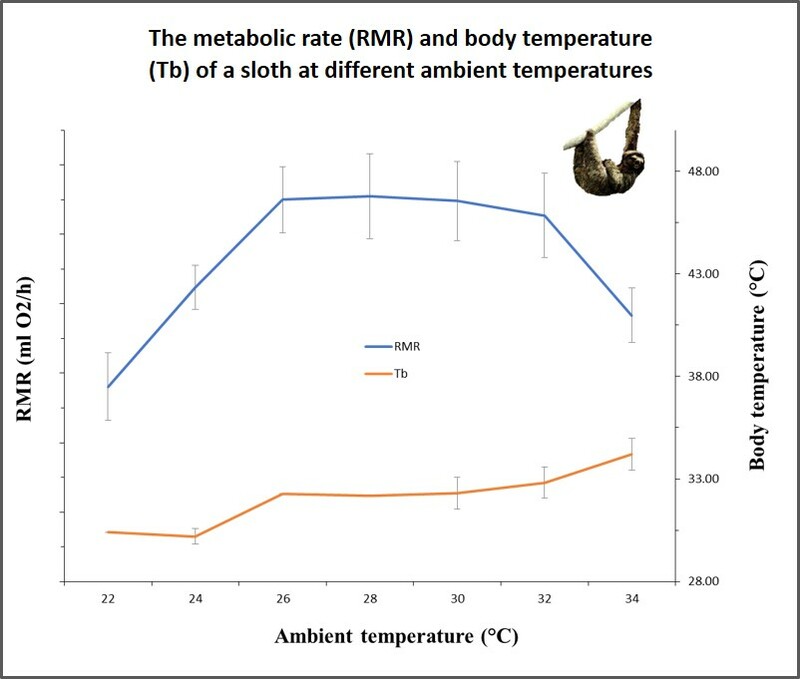 Given the strong link between sloth body temperature and that of the environment (which has led to them being likened to reptiles), an increase in temperature should, theoretically, result in an increase in metabolic rate. However, nobody really knows. Considering the sloths limited energy supply and the potential knock-on effects of a warming climate, we designed an experiment to find out. We determined the resting metabolic rate (RMR) of 8 adult three-fingered sloths (B. variegatus) using indirect calorimetry (i.e. by monitoring the oxygen consumption and carbon dioxide production of sloths that were sleeping inside of a metabolic chamber in Costa Rica). We changed the temperature of the chamber (within the natural range that sloths would typically experience in the jungle) while simultaneously recording the sloths body temperature, activity and postural adjustments. AND WHAT WE FOUND OUT…. It appears that sloths do not behave like mammals, reptiles OR birds when it comes to their metabolic response to temperature. They use very little energy when it is cold (just like a reptile), lots of energy in the middle (between 26-30 degrees), but then as they get too hot, they begin to use less energy again. 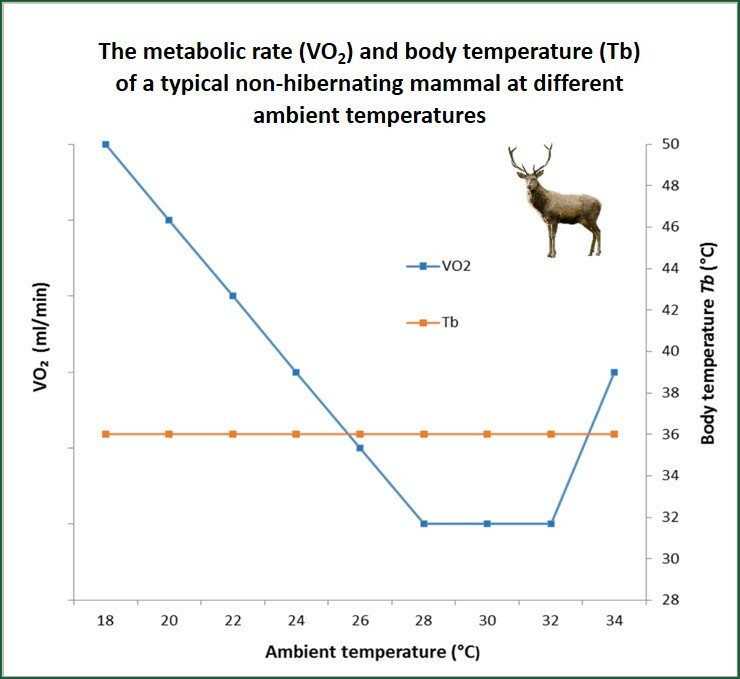 This reduction in metabolic rate at high temperatures is the exact opposite of what typically happens in all other animals. So why would they do this? Well at cold temperatures, the sloths are in a similar situation to reptiles (unable to raise their body temperature and so the metabolic rate is very low). In the middle zone, the temperature is ideal and so they can burn energy at the optimal rate (this looks like using lots of energy, but it might actually just be normal energy expenditure for a sloth). We nominally refer to this as the sloths “thermally-active zone”. This middle temperature range coincides closely with average daytime temperatures in tropical forests, when three-fingered sloths happen to be the most active and feed the most. This links in well with one of our previous publications that shows that sloths eat more at hotter temperatures due to their increase in metabolic activity increasing their rate of digestion (see: ‘Sloths like it hot: ambient temperature modulates food intake in the brown-throated sloth, Bradypus variegatus’). Finally, and here is the odd part, when it gets too hot the sloths can temporarily (and perhaps strategically) actively depress their metabolism in a manner which seems unique in the animal kingdom. While we don’t know exactly how they are doing this, to our knowledge this is the first physiological evidence of a mammal quickly invoking reversible metabolic depression without entering a state of torpor, aestivation or hibernation. But what could be the benefit? Well, when it gets too hot in the wild, all a sloth can really do is to move into the shade to cool down. It would therefore make sense to sit still, sleep through it, and wait for the conditions to become more favourable for activity. Whilst sitting still, by depressing their metabolism they are simultaneously saving energy and also reducing the amount of metabolic heat being produced by their body (and therefore staying a little bit cooler). Due to slow rates of digestion limiting the rates of energy acquisition, all sloths exist under severe energetic constraints. It appears that delicate adjustments of metabolic rate – in part as a response to temperature – are one way in which sloths conserve energy. Reductions in metabolism therefore minimise energy expenditure at cold temperatures and reduce the risk of hyperthermia at hot temperatures. Ultimately this broadens our knowledge of how animals deal with variation in temperatures, and further work to determine the underlying molecular mechanisms controlling the metabolic depression in sloths could provide important insights into the active control and suppression of metabolic rate in all mammals. In addition, this gives us vital information about how sloths rely on the envoronmental conditions for all aspects of their energy usage, and we will need to take this into account as we consider the impact of a warming climate on the sloths survival in the future. The Great Sloth Run – the first ever 5K race to benefit sloth conservation! NEWLY PUBLISHED: sloths hanging out for a drink!